Enjoy the best inspirational, motivational, positive, funny and famous quotes by Andrew S. Draper. Use words and picture quotations to push forward and inspire you keep going in life! 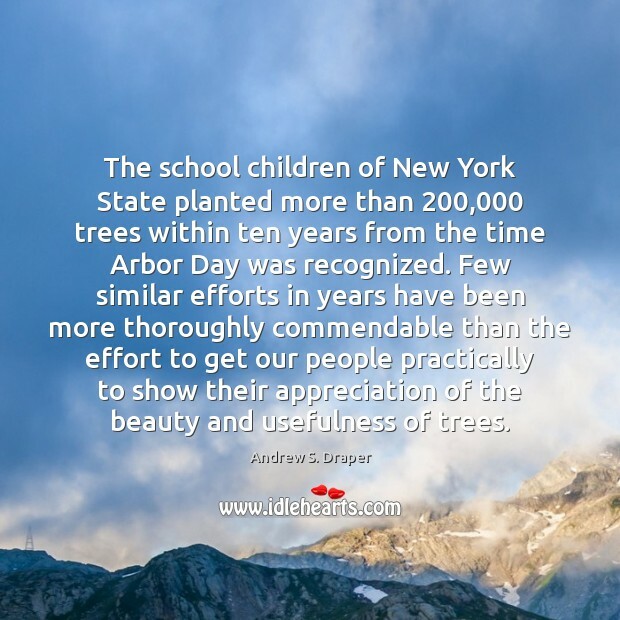 The school children of New York State planted more than 200,000 trees within ten years from the time Arbor Day was recognized. Few similar efforts in years have been more thoroughly commendable than the effort to get our people practically to show their appreciation of the beauty and usefulness of trees. 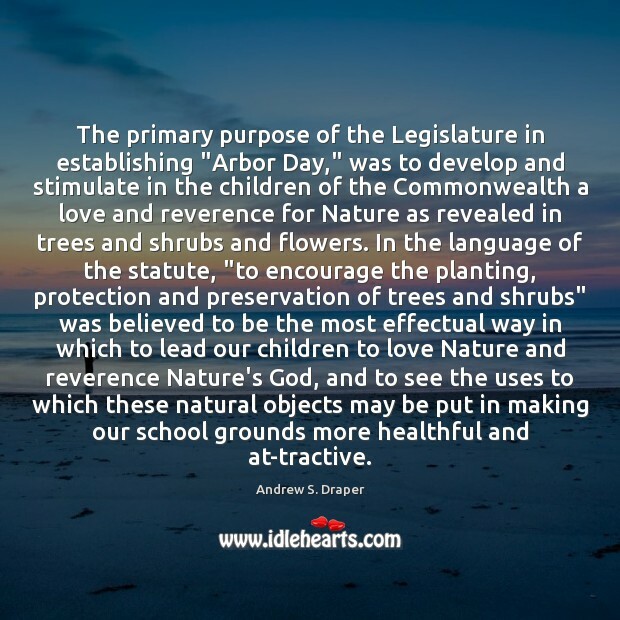 The primary purpose of the Legislature in establishing "Arbor Day," was to develop and stimulate in the children of the Commonwealth a love and reverence for Nature as revealed in trees and shrubs and flowers. In the language of the statute, "to encourage the planting, protection and preservation of trees and shrubs" was believed to be the most effectual way in which to lead our children to love Nature and reverence Nature's God, and to see the uses to which these natural objects may be put in making our school grounds more healthful and at-tractive. 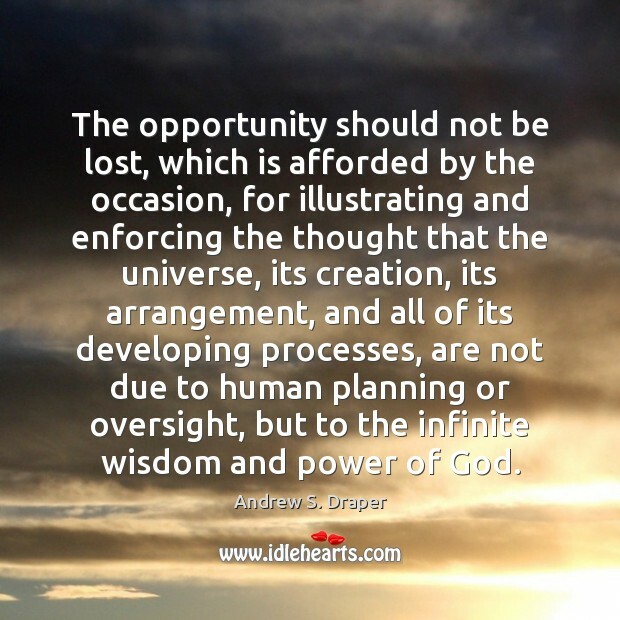 The opportunity should not be lost, which is afforded by the occasion, for illustrating and enforcing the thought that the universe, its creation, its arrangement, and all of its developing processes, are not due to human planning or oversight, but to the infinite wisdom and power of God. 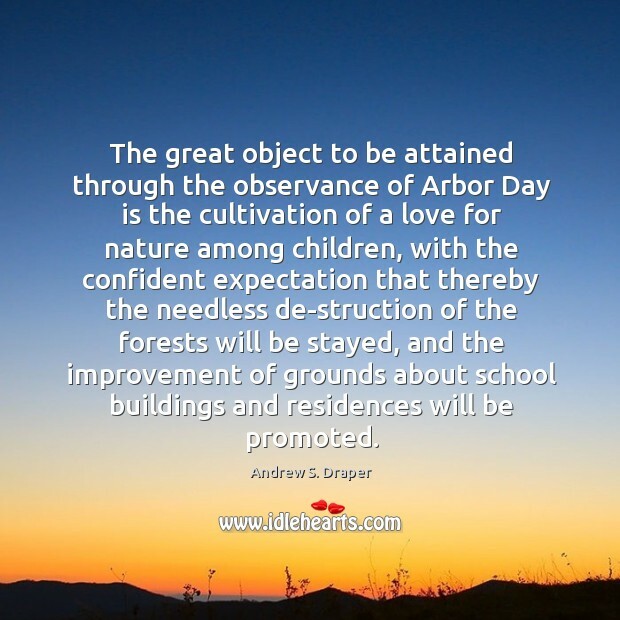 The great object to be attained through the observance of Arbor Day is the cultivation of a love for nature among children, with the confident expectation that thereby the needless de-struction of the forests will be stayed, and the improvement of grounds about school buildings and residences will be promoted.